1) As always, EMAIL with your want list. Tons of loose toys not listed yet, plus we get new items in regularly! 2) Complete figures have all of their accessories. 3) The last section to the far right has figures without weapons or file cards unless otherwise noted. 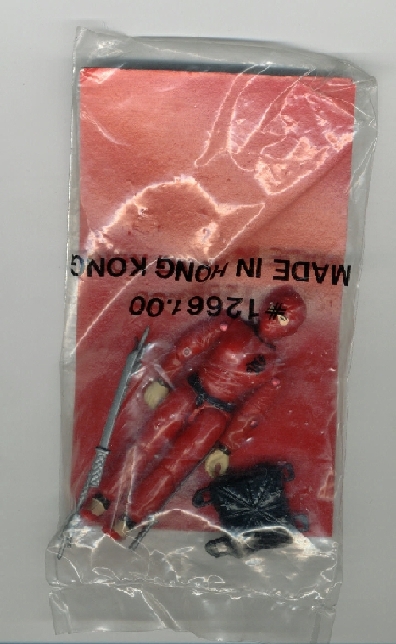 4) Straight arm version was released only for '82. 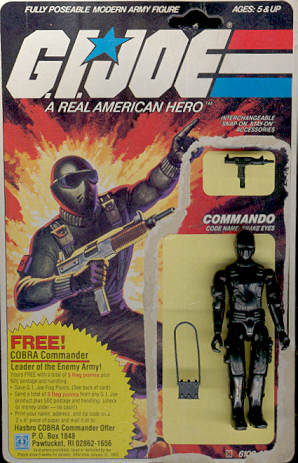 Starting in '83 the figures were made with swivel arm battle grip. 5) Read comments and description carefully. 6) C10 is not an appropriate grade for any loose figure. C10 is mint and untouched. Loose figure We grade hard with loose figure. 7) Loose : just the figure, no accessories unless otherwise noted. (pw) paint wear - usually referring to chest emblems, protruding body accessories being rubbed, etc. Discounts for American Loose figures *Please mention the "G.I. Joe Discount" when you contact us to be eligible for the savings! It is easy. Just mention the discount and save! Spend $50.00 - $74.99 on loose American Joes and receive 5% off those figures. Spend $75.00 - $99.99 on loose American Joes and receive 10% off those figures. Spend $100.00 - $159.99 on loose American Joes and receive 15% off those figures. 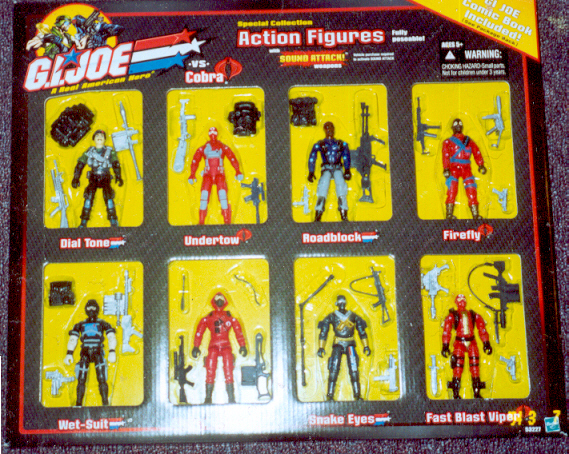 Spend $160.00 - or more on loose American Joes and receive 20% off those figures. *Discount for American figures only, and not to be combined with any other discount, or offer. Breaker. 16.99 C8.2 w/fc. 14.99 C8.5. Scarlett. 9.99 chipped off front/ broken waist. Short Fuse 17.99 C9 w/fc. Version 1 with no holes in helmet. Version 2 with holes in helmet. 2.99 C2 Broken waist piece. 1.99 C1 Broken waist piece. HISS Driver. 10.99 C6 w/ fc. Baroness. 44.99 C9.5 w/ fc. 38.99 C8.5 w/ fc. 28.99 C7.0 w/ fc. Cobra Commander, Hooded. Mail -in 5.99 C4 w/ fc damage to mask. Copper Head, Water Moccasin driver. (LIGHT green gloves) 8.99 C6 . 6.99 C4.5 . Copper Head, Water Moccasin driver. (DARK green gloves) 35.99 C8. Deep Six. 8.99 8.5 w/fc no hose. Duke. 16.99 C7 only missing binoculars. 8.99 C5 w/ hmt & bk pk. 3.99 C2. Fire Fly. 13.99 C5 missing back pack "cover" and phone. Does have gun and back pack. Ripcord. 13.99 C8.5 w/ fc 11.99 C7.0 w/ f card. 2.50 C3.5 . Roadblock. 18.99 C8 w/ file card. Scrap Iron. 29.99 C9. 7.99 C5 w/ acc pack gun. Tollbooth. 7.50 C7 w/ fc. Barbecue. 15.99 C8.2 with file card. 14.99 C8 with file card. 3.99 C6. Crank Case 8.99 C6 w/ helmet and file card, only missing gun. Heavy Metal. 7.99 C8, 5.49 C5. Lamprey. 14.99 C8.5 w/ uncut file card. Sgt. Slaughter, Mail in version. 12.99 w/ file card, missing baton. Shipwrech. 6.99 C6.5 with gun. Cross Country. 5.99 C6 w/ fc. Leatherneck. 9.99 C7 with loose joints bpc. Lifeline. 10.99 C9 w/fc 9.99 C8.2 w/fc 2.99 C8. Lift Ticket. 4.99 C8 without mic. Lowlight. 7.99 C4 with acc. pack riffle, and original riffle missing bipod.. 9.99 C8 w/bi lingual fc, only missing bi-pod. Main Frame. 12.99 C9.2 w fc. 11.99 C9 w/fc. .
Motor Viper. 9.50 C8 w/ fc. Sci-Fi. 14.99 C9., 13.99 C8. Slip-Stream. 7.99 C9 w/ fc. 6.99 C8 w/ fc. 6.99 C8 w/ fc. Wetsuit. 17.99 C9 with pcb. 7.99 C7.2 complete with broken hose. 4.99 C6.5 only missing hose. Zarana ( with earrings). 27.99 C7.5 w/fc. Crazylegs. 6.99 C9 only missing gun stock ( w/ file card). Croc Master. 2.50 C5, 0.99 C2 with broken waist. Dodger (BF 2000) 2.99 C6.5 with microphone. Fast Draw. 3.99 C8.2 w/ visor. Gung Ho 8.99 C9 w/file card. 6.99 C8 w/fc only missing one shoulder sticker. Jinx. 9.99 C7.5 4.99 C7 . Law & Order. 10.99 C9.2 w/fc 3.50 C9 Law only . Raptor. 3.99 C5 w/ wings, no falcon. 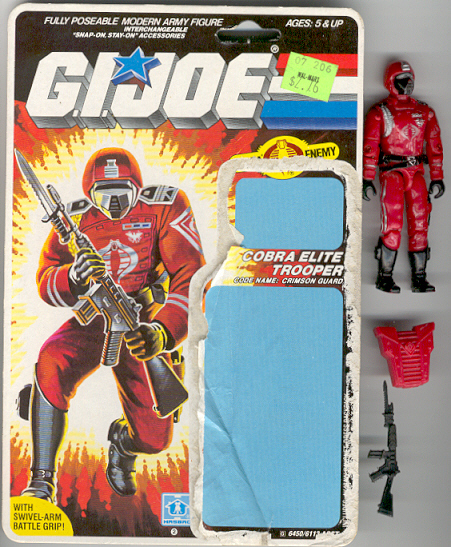 Royal Guard, Cobra La. 4.99 C6.5 . Sea Slug. 4.99 C7 . Sneak Peak. 1.50 C6.5 . Slaughter's Marauders SET OF 3. 32.99 Average C9 with bi-lingual file cards. ( 3 figures). .
Armadillo. 14.99 C9.5 w/fc. 10.99 C9. 8.99 C8.5. Astro Viper. 9.99 C9 w/fc. 2.49 C7.5 . Blizzard. 11.99 C9. 2.99 C6 . Iron Grenadier. 9.99 C9, with back card. Hard Ball. 3.99 C5.5 with back pack. 2.99 C5 w/ back pack. Repeater. 11.99 C9.5 w/ Bi-lingual file card ( English / French ) 9.99 C9 w/ file card. 6.99 C8. Skidmark, Desert Fox driver. 2.99 C4. Spearhead & Max. 2.99 C7.5 Spearhead only. Contact Us for Night Force. Annihilator. 6.99 C9. 6.99 C9. 2.50 C8.5 w/gun. 2.50 C8.5 w/gun. Ghost Rider, pilot. 7.99 C8.5 missing scarf. Snake Eyes. 23.99 C9, card with lifted bubble. 16.99 C9 w/ back card. 7.99 C4.5 . Spirit, Slaughters Marauders. 0.99 C1 broken thumbs. Clean Sweep 1.50 C7.2 . General Hawk, Talking . 2.50 C6 ( figure only, no backpack ). 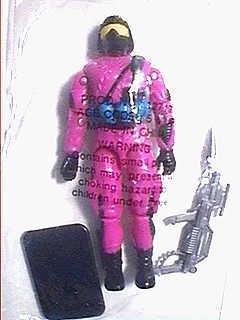 Stalker,Talking 2.50 C6 ( figure only, no backpack ). Bazooka. 1.99 C9 . 1.99 C9. Big Bear. 8.99 C9 card with lifted bubble. Gung Ho. 10.99 C9 card with lifted bubble. Nunchuk., Ninja Force 2.99 C8 . 2.50 C7.2 . Slice, Version, Ninja Force, 1 Red outfit. 5.99 C8.5 . 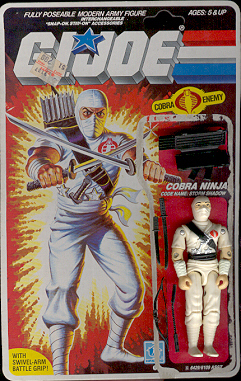 Storm Shadow, Ninja Force. 4.50 C7 . Slice, Version, Ninja Force, 2 Orange outfit. 8.99 C9.5 . 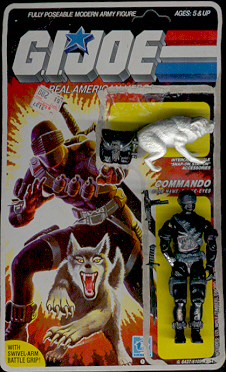 Snake Eyes, Ninja Force 6.99 C7 no weapons, with back card.